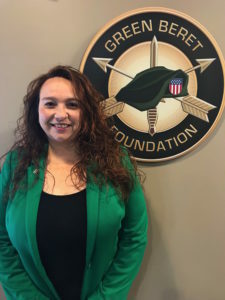 Ms. Rhonda Marshall brings over 20 years of management and human resources experience to the Green Beret Foundation. Although Ms. Marshall formally serves as the Accounting Manager here at the Foundation, she wears multiple hats supporting all program and development efforts as well. Rhonda not only brings extensive knowledge, experience, empathy and passion for both the Special Forces’ and GBF’s missions, she brings her relentless positive attitude and knack for identifying solutions quickly to complex and many times stressful situations. Rhonda is the GBF’s official cheerleader always keeping us positive and in good spirits regardless of what has been presented to us. She brings a unique and fresh perspective to the GBF. Rhonda’s empathy and passion for our mission comes from personal experience. Rhonda is a Steel Mag and is also a cancer survivor. In addition to pursuing her path to support Green Berets and their families, she has chosen to continue her education and work toward her degree in the medical field in hopes in making even more of a impact. Supporting the military is not a new initiative for Rhonda. She’s always been a supporter of the military. Several of Rhonda’s family members have served in the armed forces and her father served for a brief period in the Army during the 1960s. Rhonda was raised to be an American patriot. Rhonda can be found, once again, being a cheerleader for her man clan at sporting events and anything her family is pursuing. Rhonda is a native Texan and resides with her husband David and two sons in San Antonio, TX.